Research offers hopeful news to women whose breast cancers are typically more difficult to treat: Modern chemotherapy means more of them will survive than previously thought. The latest findings offer more evidence that a tumor's "personality characteristics" are more important than size and how much the cancer has spread. Often the key is whether the tumor is fueled by the hormone estrogen. Increasingly, doctors are considering that when recommending treatment. About two-thirds of breast cancer patients have hormone-fueled tumors. Typically such cancers are treated with tamoxifen and other groundbreaking hormone-blocking drugs, which have fewer side effects. These women sometimes get chemotherapy too, although the new study suggests many of them will do just as well without it. 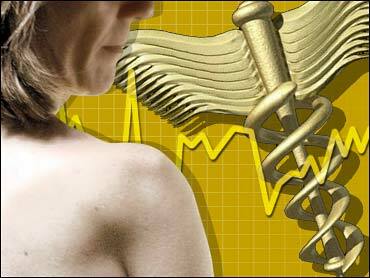 But that still leaves about 70,000 U.S. women diagnosed each year with nonhormonal cancer. The new study found that advances in conventional intravenous chemotherapy give many of those patients almost as good a chance at survival as women with estrogen-fueled tumors. While tamoxifen "changed the landscape" for estrogen-fueled tumors, "the playing field has now been leveled somewhat" because nonhormonal cancers respond so well to modern chemo, said lead author Donald Berry, a biostatistician at M.D. Anderson Cancer Center. a Women's Health Initiative expert explain the study's data. The research supports updated guidelines released in December by the National Comprehensive Cancer Network, a group of leading cancer treatment centers. They recommend that treatment be based partly on the tumor's hormone status. "Breast cancer isn't one disease, and one size won't fit all," said Dr. Eric Winer, a co-author and director of the breast oncology center at Dana-Farber Cancer Institute in Boston. The study appears in Wednesday's Journal of the American Medical Association along with an unrelated report from the government's landmark research into hormone pills. That study shows that unlike estrogen-progestin pills, estrogen-only pills don't increase older women's risks for breast cancer. The new results, based on an updated analysis, echo findings from a report two years ago that showed estrogen pills linked to a higher risk of strokes, but not breast cancer. The research on tumors and treatment is an analysis of 20 years of data from three studies involving 6,644 patients whose disease had spread to lymph nodes. Modern chemotherapy improved five-year cancer-free survival rates by almost 23 percent in women with nonhormonal cancer, versus just 7 percent in women with estrogen-fueled disease. The latest chemotherapy regimen studied — three drugs including Taxol and infusions every other week for 16 weeks — reduced the risk of recurrence and death in patients with nonhormonal disease by more than 50 percent, compared with older, lower-dose and less frequent regimens. The results reveal "just how big an effect the new chemotherapy is having" on women with estrogen-negative cancer, and likely will instill more optimism about these women's prognosis, said Debbie Saslow, director of breast and gynecologic cancer for the American Cancer Society. The estrogen pills study involved 10,739 postmenopausal volunteers in the Women's Health Initiative. It found that the pills increase older women's risks of abnormal mammograms just as pills containing estrogen and progestin do. That's because hormones can make breast tissue denser and harder to interpret on mammograms. That often results in repeat mammograms to clarify the initial images, a process that can be costly and anxiety-provoking. Wyeth's Dr. Eileen Helzner called the results reassuring, but said women should discuss their individual risks with their doctors before deciding whether to take hormones at menopause.